The International break was clearly productive for Sam Allardyce and West Ham, as they have turned out with an unexpected new formation that showed promise a week ago Monday against Hull City and has produced a dramatic victory against Liverpool this past weekend. It’s would be easy to say that the change is merely a matter of personnel. In my previous assessment of Allardyce’s new adventure in expansive football, I pointed to worrying (Nolan, Cole, Vaz Te) and promising (Kouyaté, Downing, Cresswell, Valencia, Zárate) players. The promising ones have featured in the last two games, along with Diafra Sakho and deadline-day signing Alexandre Song. But in my view, Allardyce deserves considerable praise for adopting a formation that allows for a strike partnership up top without diluting midfield strength. In both games, West Ham were in what used to be called a 4-3-1-2. It’s not quite clear to me if there’s actually a distinction between this and the currently popular terminology of 4-4-2 with a midfield diamond. If there is, it’s that the “midfield diamond” involves something approaching actual wingers, while a 4-3-1-2 is a more consciously narrow formation, relying on the full backs to provide width in attack. (In practice, of course, many formations involve some mixture of these two traits in ways that make this distinction–like many abstract tactical schemas–somewhat academic). 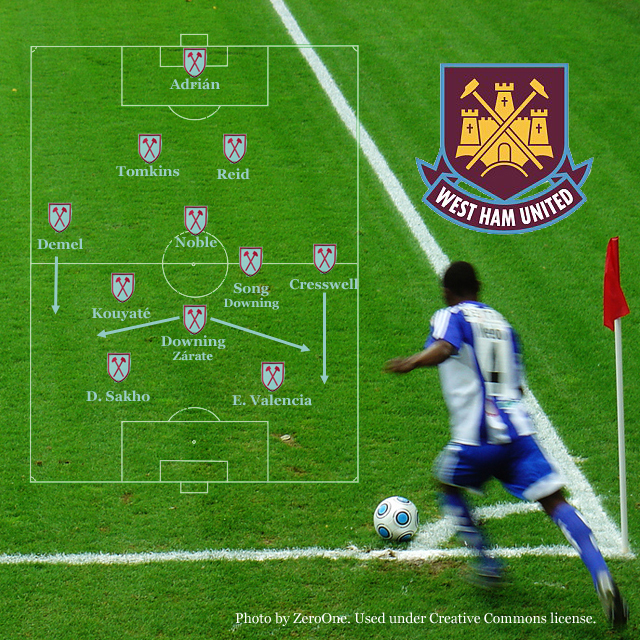 West Ham leaned more to a traditional 4-3-1-2. Their midfielders generally remained in the triangle of their previous 4-3-3, though Cheikhou Kouyaté drifts slightly toward the flank. Aaron Cresswell in particular, but also Guy Demel provide width, as do the strikers and the trequartista (especially Stewart Downing) from the top of the pitch. The formation allows Allardyce to bring in two forwards without sacrificing solidity in the midfield. As it happens, West Ham have been doing a much better job of maintaining possession this season, and this formation should allow that to continue (notwithstanding Liverpool’s advantage in that area on the weekend). The new formation only makes sense, though, in terms of how it leverages the new talent at Upton Park. No doubt eager to get both Enner Valencia and Diafra Sakho into his starting XI, Allardyce made the bold move of deploying Stewart Downing as a central or inside winger. Even when deployed on the right flank in the opening three games this season, Downing has frequently drifted inside to help support the midfield. Shifting him to an inside role was a logical extension of that new approach. Against Hull, Downing played to the left of Mark Noble, only moving to the trequartista role he would play against Liverpool when Song replaced Mauro Zárate for the final 30′ of the game. Downing was the game’s most influential passer, completing 58 of 60 passes, 25 of 26 in the attacking third. Against Liverpool, he started in the trequartista role under the strikers. While he did a very good job offensively in that role, he was even better in his defensive task of shutting down Steven Gerrard. For the 69′ that Downing played in that position (he was eventually replaced by Morgan Amalfitano, moving back to Song’s position left of Noble), Gerrard completed only three passes in West Ham’s half. Downing has already completed more assists this season than he did in the whole of 2013-14 (with thanks to Gary Parkinson‘s thoughtful analysis of the game at FourFourTwo for that fact). He has been the most important player for the Hammers thus far. Equally promising is the fact that three different players have scored goal of the week candidates thus far: Zárate against Crystal Palace, Valencia against Hull City, and Sakho against Liverpool. The last time it was reasonable to expect goals of this quality from West Ham was during Alessandro Diamanti’s unreliable but exciting stint in the 2009-10 season. Whether these attacking lights can continue to shine once they have become a more recognized threat within the Premier League remains to be seen, but they have certainly brought a new level of excitement to watching the Hammers play. Finally, Alex Song is showing that one can look completely out of sorts and a step behind at Barcelona, yet still prove a critical contributor at less Olympian heights. I was frankly worried about the Song signing, but his opening two games, particularly the Liverpool one, have demonstrated the shrewdness of this loan deal. With everything looking up for the Hammers, it’s only natural to start wondering what will go wrong. The success of Allardyce’s 4-3-1-2 raises questions about what will happen when Andy Carroll and Kevin Nolan return to health. Carroll seems more easily reconciled to the new formation, potentially slotting in as one of the forwards when a more traditional target man seems desirable. It’s also possible to imagine Carroll and either Valencia or Sakho fronting a more traditional 4-4-2, seeking service from Downing and possibly Jarvis on flanks. Song and Kouyaté would probably serve as the midfield in that scenario, Mark Noble’s passing sacrificed to defensive strength. This is not an inspiring approach, but one could imagine situations in which it would be the best line of attack. Particularly if Downing continued to slip inside when possible, it’s not entirely disheartening. Nolan is the more challenging player to imagine reintegrated into the current side. It is difficult to see how he will function outside the 4-3-3 of previous seasons. He lacks the creativity needed for a real playmaker, but playing him in a deeper role would seem to waste his primary value as a late-arriving attacker. He might play as one of the more advanced midfielders if Carroll is up top, but this seems likely to become a 4-2-2-2, Nolan effectively alongside the playmaker with the other midfielders sitting back for defensive cover. That sounds like a plan B rather than a brief for the starting XI (unless you’re Real Madrid). The win against Liverpool continues Allardyce’s pattern of delivering at least one marquee performance a season: our first win against Chelsea in over a decade in 2012-13, followed by the 4-6-0 humiliation of Tottenham on the way to a treble of victories against Spurs last season. Notwithstanding those victories, the win against Liverpool feels more potentially lasting than any of those earlier triumphs. As Peter Thorne (Billy Blagg) notes in his excellent game review for ESPN, it may be time for some humble pie at the Boleyn Hotel for Allardyce’s critics.